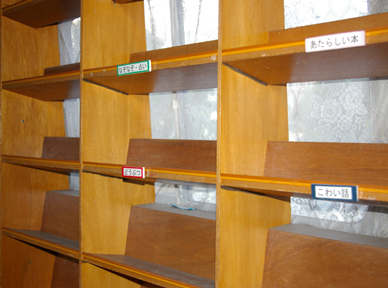 Group loans of library material are made available to community, professional and social-educational groups located within the City of Fukuoka including kindergarten, elementary schools and old age facilities as well as local organizations involved in promoting reading activities at civic centers and assembly halls. To qualify, the group must: a) be able to clearly identify who is charge of the organization and must have a place to store the material it borrows, b) have at least 20 members including adults and children and c) be able to allow its members to read and/or borrow the material the group borrows from the library. 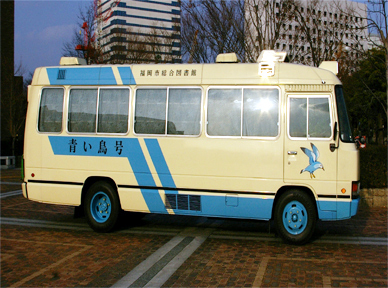 Groups loans of library material are delivered and picked up for return by the library's "Library-on-Wheels" which distributes such material. Restrictions apply on the volume of library material that can be borrowed and for how long they can be checked out under the Group Loan system (left picture: "Library-on Wheels" right picture: inside the "Library-on Wheels" ).